The expansive, light and less tightly laid out El Jardin del Paraiso, is just across the street Parque de Tranquiliad and is located on the north side and extends the full way to East 5th street where there is also an entrance. One of the earliest gardens in a particularly burnt down area, the large El Jardin del Paraiso is a permanent Parks Department park. 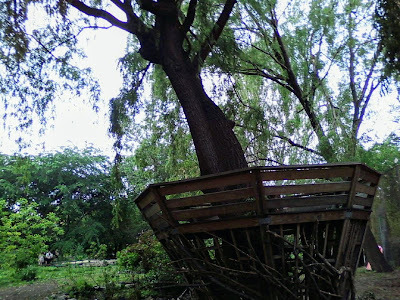 It includes a swampy area, a pond and a designer tree house in the large weeping willow (a must for climbing!). This site has also developed swales, for proper stormwater management and to adapt to our changing climate.